Pranic healing knife is used to cut the cords and links from energy body, organs and the chakras. Negative, unwanted cords links or attachment which are formed in our daily life dealing with the people. These are generally formed when a person becomes angry, jealous, hate, fearful with other person. These unwanted cords or links can be vise versa just like other are jealous,angry or any other negative emotions for you. In long run these unwanted links and cords become prominent and comes in between proper functioning of the chakras resulting in ailments. These unwanted links also blocks the progress of a person financially,materially and physically. These result in depletion of the energy body and the chakras. Quartz crystal knife is very effective in cutting the cords from its roots. Once the cords are cut properly healing becomes very easy. 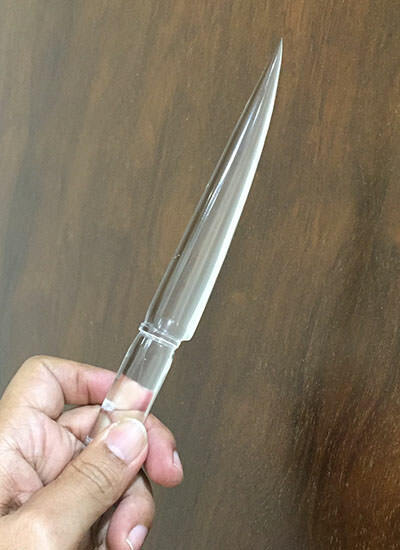 This knifes are made from natural quartz crystal and are one piece. The quality of the crystal used in of good quality and the craftsmanship is excellent. These knife comes with natural inclusions or flaws. We try to get them manufactured with very less inclusions.